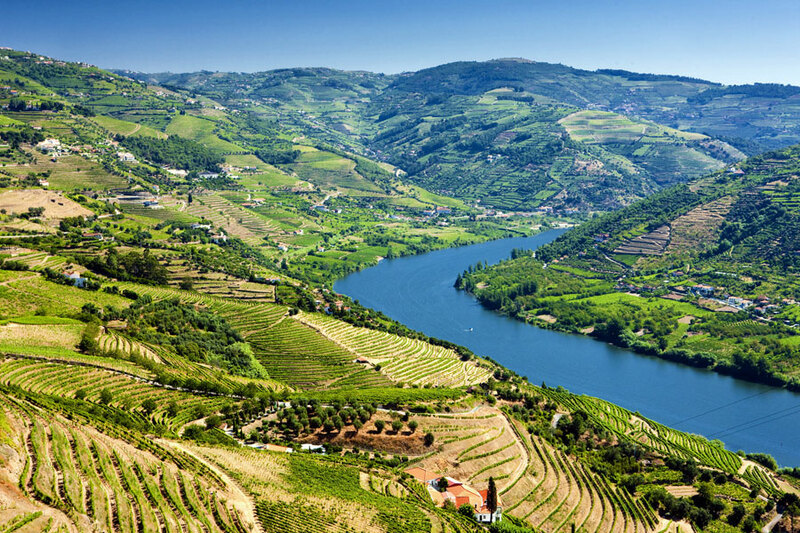 The Douro Valley is home to the River Douro, the third largest river in the Iberian Peninsula, which runs for eight hundred and ninety seven kilometers from the Spanish town of Duruelo de la Sierra to Porto, Portugal's second city. For one hundred and twelve kilometers the river forms part of the border between Spain and Portugal. In the past, impassable canyons formed a barrier against marauding armies. Today this wild and beautiful frontier landscape is protected by the authority of the Douro Internacional Park. The Douro River and the Douro Valley are known primarily for Port, a sweet wine that has been produced here for two thousand years, along with less well-known red and white table wines. The Alto (upper) Douro, also known as the Douro Vinhateiro is dominated by big placards on the hillsides bearing the names of famous Port producers such as Cockburns, Taylors and Sandeman. The spectacular landscape is characterised by improbably steep terraces covered in vines and dotted with wine-producing farms called quintas (where it is often possible to get a bed for the night). Hills fall steeply to the water's edge and the region becomes more and more sparsely populated as it travels inland from the coast. Local presunto (smoked hams) and chouriço (spicy sausages) are often on the menu and many of the quintas offer port and wine tasting sessions. Details are available at the tourist office in Regua. The Douro Valley can be accessed by roads that zig-zag up and down the steep hills, although it is probably easier and certainly more scenic to travel by rail or boat. The Linha do Douro is one of Europe's great rail journeys, connecting Porto with the towns of Rio Tinto, Ermesinde, Valongo, Paredes, Penafiel, Livracao, Marco de Canaveses, Pinhão, Régua, Tua and Pocinho. The one hundred and seventy five kilometer route joins the river at Mosteiro and runs alongside it for a hundred kilometers before climbing steeply and travelling around unbelievably sharp horse-shoe bends through terraces so steep harvesting them must be nigh-on impossible. A picturesque steam train runs aong the Linha do Douro on Saturdays from May to October. The Douro River was originally fast-flowing and unpredictable but the construction of eight dams in the second half of the last century has rendered it tranquil and lake-like. Cruise boats set out regularly from Porto to points along the Alto Douro, navigating locks of breathtaking height. Cruises vary from a few hours to several days, while the ferry from Porto to Régua takes eleven hours there and nine hours back. The river's many tributaries, all of which flow into deep canyons, remain unavigable. Before the building of the dams wine used to be transported downriver in flat-bottomed boats called rabelos. Now it goes on tanker lorries. The Douro Alto was made a UNESCO World Heritage Site in 2001, in recognition of the spectacular beauty of both the natural and built landscape and the industrial heritage associated with the Port producing industry. The Douro Vinhateiro is a microclimate where olives, almonds and grapes all grow easily. The 'capital' of the Douro Valley is a town called Peso da Régua, which is dominated by a huge Sandeman's logo perched on top of a hill. It was here that wines were collected before being transported downriver to Porto. Régua, which straddles the river and has a lively selection of waterside cafes and bars, is home to the headquarters of the Port Wine Institute. The town of Pinhão marks the start of port production. A small town on the north bank of the river, Pinhão is twenty five kilometers east of Régua. There are few settlements along the line between Pinhão and Régua. One, a village called Tua, which is little more than a junction, marks the start of another scenic railway line that runs for one and a half hours along the rugged Tua valley to a place called Mirandela. The road to Vila Nova Foz Coa from Regua is somewhat hairy, winding erratically up and down mountains. There is plenty of compensation in the views, however, which are spectacular. The town itself, once reached, occupies a gorgeous location high above the River Coa, a tributary of the Douro. This is an area of olives and almonds, rather than grapes, which means that in early Spring the terraces are bursting with white and pink flowers. Vila Nova Foz Coa is the closest town to twenty two thousand year old rock paintings discovered during the construction of a dam and now protected as another UNESCO World Heritage Site. The carvings are remote and relatively challenging to visit. The local national park office has information about how to approach them on foot. Other towns in the Douro Valley worth a visit are Lamego, with the striking church and shrine of Nossa Senhora dos Remédios, reached via seven hundred zig-zagging steps up a steep hillside, and Vila Real, an important regional centre and home to the Mateus Palace and gardens, which are open to the public. The Douro Valley offers plenty of good walking.